DAVID BOWIE David Bowie Is - Japanese V&A Bundle (This exclusive bundle was acquired by our buyer from Japan, each item was produced exclusively for the V&A 'David Bowie Is' exhibition in Japan with no release anywhere else in the World. Includes the Lady Stardust / Crystal Japan limited edition 7" Picture Disc single, Blackstar limited edition 3-track 12" single pressed on Red Vinyl, and a box of Nine Chocolates, with a custom printed carrier bag for the 7" & 12", along with three promo flyers that were available at the exhibition. Please see below for more details on the individual main items). 2017 Japanese only limited edition 7" Picture Disc single manufactured in the EU, exclusively for the V&A 'David Bowie Is' exhibition in Japan. The A side features an image taken from a sessionin February 1973, at RCA Studios in New York, with Bowie wearing a costume by Japanese designer Kansai Yamamoto, and Kabuki inspired make-up. The Sukita photograph on the AA side was taken in Tokyo in 1980. The disc remains nestled within the title sticker-sealed in the clear PVC sleeve and comes accompanied by a copy of the printed V&A exhibition carrier bag! DBISN2017. 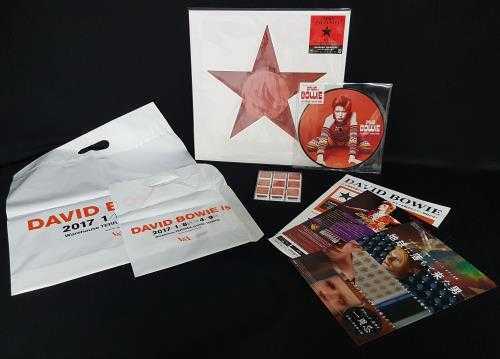 2017 Japanese only exclusive limited edition 3-track 12" single pressed on Red Vinyl, exclusively for the V&A 'David Bowie Is' exhibition in Japan, also including the Radio Edit versions of Lazarus and I Can't Give Everything Away, 'star' die-cut sleeve with a red spot lacquered back, plastic inner, along with a lyric insert & fold-out poster, within a hype stickered clear protective sleeve and includes the printed V&A exhibition carrier bag & a flyer advertising this 12" along with the most recent reissue colour vinyl albums. 2017 Japanese box of Nine chocolate's manufactured by Deco Choco, exclusively for the V&A 'David Bowie Is' exhibition in Japan. Each bit of chocolate is individually wrapped with 'David Bowie Is...' text on each apart from the one in the centre which has a classic Bowie image. These remains still in the clear plastic outer case with V&A and Japanese sticker on the bottom. Please note that these have gone past their best before date, but ideal to keep as a collector's item.